Enrich community atmospheres with these eco-friendly square recycled plastic tables. 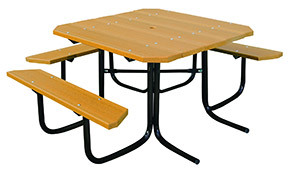 The classic style 48" square picnic tables are designed utilizing 96% post-consumer recycled plastic materials planks—reinforced with two internal 1/4" x 1" steel strips. The ultra-resilient powder-coated finish protects the all-steel, precision crafted 1-5/8"O.D. frame. 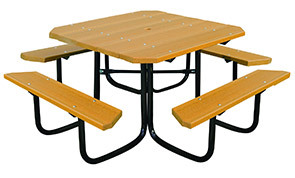 These ultra-durable and maintenance free square picnic tables are available with standard 4 seats or ADA accessible 3 seat configuration to best suit facility requirements.